These two sets of comments on Volume II of my Rationality and the Structure of the Self (henceforth RSS II), from the two leading philosophers in their respective areas of specialisation—Kant scholarship and decision theory—are the very first to appear from any quarter within academic philosophy. My gratitude to Paul Guyer and Richard Bradley for the seriousness, thoroughness and respect with which they treat RSS—and my admiration for their readiness to acknowledge the existence of books that in fact have been in wide circulation for a long time—know no bounds. Their comments and criticisms, though sharp, are always constructive. I take my role here to be to incorporate those comments and criticisms where they hit the mark, and, where they go astray, to further articulate my view to meet the standard of clarity they demand. While Guyer’s and Bradley’s comments both pertain to the substantive view elaborated in RSS II, my responses often refer back to the critical background it presupposes that I offer in RSS Volume I: The Humean Conception (henceforth RSS I). I address Guyer’s more exegetically oriented remarks first, in order to provide a general philosophical framework within which to then discuss the decision-theoretic core of the project that is the focus of Bradley’s comments. I am deeply indebted to Paul Guyer for bringing to the reader’s attention a range of issues raised by RSS II. My reply to his comments indicates that we are in agreement about many more of these issues than he supposes. I focus here on his valiant attempt to locate the view defended in RSS II within the prevailing taxonomy of contemporary metaethics. Guyer’s comments afford me a welcome opportunity to distance my view in every significant respect from any of the existing templates on that familiar map. My view is neither Kantian Constructivist, nor Deductivist, nor Instrumentalist (much less deontological or consequentialist). In RSS II, I characterise my view as Ur-Kantian because it is grounded more closely in Kant’s texts than any of these other contemporary views. But I distance mine even from those texts in significant respects. Originally, Rawls’s main aim was to stipulate an intrinsic connection between a value-neutral conception of the person and a value-neutral decision procedure such that “within this procedure persons characterized as rational agents of construction specify, through their agreements, the first principles of justice ”. The term ‘procedure of construction’ occurs, undefined, in three of the above four sentences, and the term ‘procedure’ in all four of them. The ‘procedure’ to which Rawls repeatedly alludes in this passage, and whose outcome “determines the content of the first principles of justice ”, is the decision procedure he began to develop very early on in his ‘Outline of a Decision Procedure for Ethics’ (Rawls 1951). Although the details of this procedure undergo change over time, his aim for it until late in his life remained “to establish the objectivity of moral rules, and the decisions based upon them […] the decision procedure, which can be shown to be both reasonable and reliable, at least in some cases, for deciding between moral rules and lines of conduct consequent to them” (1951:177). And he reminded us in A Theory of Justice of the analogy he meant to draw with the decision procedure followed in social theory, in which “rational individuals with certain ends […] are to choose among various courses of action […] [and] […] [w]hat these individuals will do is then derived by strictly deductive reasoning from these assumptions about their beliefs and interests, their situation and the options open to them” (1971:119). Here, too, in constructing the metaethical foundations of a normative theory of justice, he maintains, “[t]he argument aims eventually to be strictly deductive” (1971:121). Thus despite the many differences among these texts, Rawls’s position in all of them is that Kantian constructivism aims to justify basic normative principles as the necessary outcome of an underlying value-neutral decision procedure, enacted by rational agents, from which those first principles can be derived. Rawls’s account of Kantian constructivism is thus recognisable as a species of Deductivism, the method of moral justification that attempts to derive normative moral principles from a conceptual analysis of value-neutral premises that are presumed to generate it. I critique the general strategy of Deductivism at length in RSS I, Chapter IX, Section 2. Thomas Nagel, Alan Gewirth, Rawls, and Richard Brandt, in addition to Kant, are all Deductivists; I examine their views in RSS I, Chapters VII, IX.3, X and XI respectively. But Rawls’s particular kind of Deductivism, which he calls ‘Kantian constructivism’, is distinguished by the nature of the premises he stipulates, namely the idealised rational agents, together with the constraining conditions, quoted above, under which they choose. These premises identify Rawls’s view as that subcategory of Deductivism in which the premises define a value-neutral decision procedure, utilised by rational agents, that is instrumental to the generation of foundational normative principles as the necessary result of that procedure, i.e. as Instrumentalist. I discuss Instrumentalism in general in RSS I, Chapter IX, Section 4; and Rawls’s Instrumentalism in particular in RSS I, Chapter X. So a view that does not justify its normative first principles as derivable from a rational agent’s decision procedure is not an Instrumentalist view, and therefore not a species of Kantian constructivism as Rawls intended that term to be used. Rawls’s explicit criteria, and his emphasis on the centrality of a decision procedure to generating normative principles, exclude most self-identified Kantian constructivists, aka New Kantians, from their scope. However, there are other views that satisfy the Instrumentalist criteria Rawls enunciated for Kantian constructivism to which he also would have denied that label. Richard Brandt’s ‘rational desire’ theory of moral justification deduces moral principles as the necessary outcome of choices made by fully informed rational agents who have undergone cognitive psychotherapy. I examine Brandt’s view in RSS I, Chapter XI. Moreover, there are other varieties of Deductivism that are closer in spirit to Rawls’s avowed Kantian loyalties, even though they violate his stated Instrumentalist criteria. Alan Gewirth’s method of moral justification, which attempts to deduce moral first principles directly from the concept of action, would be one; I discuss Gewirth’s arguments in RSS I, Chapter IX, Section 3. So the term, ‘Kantian constructivism’ does not delineate the ‘family of views’ that Rawls claimed and to which Guyer refers. What all of these views do have in common is their attempt to establish a deductive relationship between metaethical premises and normative conclusions—but not always specifically between an agent defined by the procedural guidelines of rational choice and the moral principles such an agent would choose. Rather, the deductive relationship is supposed to hold more generally, between some stipulated foundational concept related to agency and the resulting moral principles. It is the aspiration to that relationship of logical derivation of substantive moral principles from universal, value-neutral premises that unites those of Rawls’s students known as Kantian constructivists. Rawls never explicitly disowned Kant’s agenda of demonstrating a necessary relation of logical derivation between the universal requirements of reason and the particular deliverances of moral decision-making; and those of his students who identify themselves as Kantian constructivists have not done so, either. I am not one of those students. I do explicitly disown this agenda. Guyer ascribes to me the views that “commitment to morality is implicated as the condition for including intentions and choices in a self that is unified by the conditions of rationality as such”; and that “the conditions for unified selfhood provide the conditions for the development of moral emotions, and these lead to moral principles”. But even if these views accurately summarised my claims, neither of them would describe deductive relationships. That P is implicated as a condition for Q does not mean that P implies Q. And that the conditions for P provide the conditions for Q, which leads to R, does not mean that P, or even P and Q, necessarily lead to or imply R. The necessary relation of logical derivation fails to hold in both cases. In fact, I would deny that a commitment to morality is a precondition for including intentions and choices in a rationally unified self, although it may well be an empirical outcome of that unity. On my view, rather, intentions and choices are part of a rationally unified self because and to the extent that—as on Kant’s view—conscious experiences in general are part of a rationally unified self; and those intentions and choices, independently of their content, are conscious experiences. Similarly, I would deny that the development of moral emotions necessarily lead to any principles at all. An upbringing that develops only the moral emotions of shame and resentment may lead only to wholesale rejection of the very idea. For all of these reasons, I do not and could not identify my view as Kantian constructivist. [H]ow does Piper herself propose to make the transition from unified selfhood to full-blown morality? […] [D]oes acceptance of the requirements of unified selfhood itself entail commitment to the interpersonal principles of morality as normatively understood? Is unified selfhood a sufficient as well as a necessary condition for commitment to morality? my answer would be in the negative. I do not propose to make any such transition from unified selfhood to normative morality, and unified selfhood on my view does not entail commitment to normative morality. As Guyer himself then observes, “the conditions for unified selfhood […] do not guarantee that even interiorised agents will always act in accordance with these principles”. My view is rather that the canons of classical predicate logic structure all of the conscious experiences—including the beliefs, perceptions, desires and intentions—of a unified self; and that only such a rationally unified self is capable of formulating coherent moral intentions. But this does not imply that a rationally unified self must formulate them. Whereas the structure of an intention is supplied by the logical preconditions of thought, its content is always a function of empirical circumstance. So a particular, fully formed moral intention always instantiates the rational structure of intention, but can never be logically derived from it. My project is more modest than the Deductivist’s, and therefore has a correspondingly greater chance of success. In light of my wholesale rejection of the Deductivist project as misguided and futile, Guyer is right to distinguish my view from that of Christine Korsgaard, who “succumb[s] to the fantasy of assuming that […] [we can] explain moral failure only as defective reasoning about what morality requires rather than as a direct choice not to be moral”. But he then goes on to interpret my distinction between psychological consistency as a contingent preference and metaphysical consistency as a necessary precondition for having contingent preferences—or indeed, unified intentional states of any kind—as in some sense similar to Korsgaard’s profoundly confused neo-Deductivist claim that “an agent that is not a mere heap […] cannot but act rationally, although it might fail to correctly infer what is rational in some particular case”. The suggestion that not being a mere heap implies rational action is an amusing one: picture a neatly sorted, packed, taped, bagged, labelled, and stacked mound of garbage, sitting at a computer in readiness for the ‘garbage-in’ stage of the Deductivist procedure, evaluating the choice options in a normal form decision tree. But even more amusing is the failure it expresses to grasp my view. In an anonymous reader’s report on RSS II of 2003 for Oxford University Press that bears a remarkable resemblance to Korsgaard’s distinctive manner of thinking and writing, the reader tasks me with the same project as does Guyer, of “explaining how the ideal of perfect practical rationality must motivate actual human beings in a morally normative way”. But we have just seen above that RSS II repeatedly disowns that project as a waste of time. In case the foregoing examples did not suffice, its futility is amply illustrated by Korsgaard’s own failed attempts to realise it, in which this vague and bloated ‘must’ of metaphysical necessity is supposed to pack the same browbeating wallop as does the notion of a ground project for Bernard Williams or the notion of a second-order desire for Harry Frankfurt (I criticise both of these views in RSS I, Chapter VIII, Sections 2 and 3). Her approach applies the Deductivist methodology of Alan Gewirth, her former senior colleague at the University of Chicago, to whose Reason and Morality her arguments are clearly indebted. As I discuss in detail the failings of Gewirth’s view in particular in “Gewirth’s Deductivism”, cited above, there is no need to dwell at greater length on those of his disciples. the force of such a ‘metaphysical necessity’ is obscure, at least to me. If it is meant to define an ideal of rational agency to which the agency of flesh-and-blood human beings ought to conform, then its normative hold on such actual human beings remains to be explained; if it is meant to describe a regularity to which flesh-and-blood human beings invariably conform, then it seems to be belied by the all too frequent divergence of human beings from it. This brand of ‘metaphysical necessity’ is obscure to me, too. That is why I unconditionally reject it, and address the failings of this general approach, in the chapters and sections from RSS I listed above. As I join Guyer in rejecting this useless notion, his binary distinction between metaphysical necessity and moral psychology as a taxonomic device for identifying RSS II as a normative moral theory would require, at the very least, a respectably rehabilitated account of metaphysical necessity in order to carry any weight. As he does not offer such an account, I also reject that taxonomy. My view has nothing whatsoever in common with the Deductivist tactics outlined above. Guyer’s complaint does not apply to my argument, because mine does not invoke any such unexplicated notion of metaphysical necessity. In my usage, the term ‘metaphysical’ means what it standardly means according to the OED, i.e. it refers to explanatory first principles, preconditions or premises that a particular state of affairs presupposes. These may be material or nonmaterial, concrete or abstract, specific or general, as the case may be. My claim that a unified and internally consistent self is a metaphysical precondition for having psychological likes and dislikes is no more obscure than claiming that a magnetic field is a metaphysical precondition for a magnet’s attracting some objects and repelling others. In both cases, the former is an explanatory premise of the latter. Thus there is no suggestion in my argument that any obscure notion of metaphysical necessity functions to define ideal agency, flesh-and-blood agency, or the relation between them. Guyer acknowledges my thesis that “although preserving an internally coherent self in this sense is a good, it is not an end, goal or intentional object that an agent can adopt or at which he can aim. Therefore, while it can be a justifying reason for action, it cannot be the object of a preference (II, p. 177)”. Yet he then immediately goes on to ascribe to me the contradictory commitment, “actually to a normative position that unified selfhood is a good that human beings ought to strive to realise etc.”. However, none of the passages Guyer cites in support of his claim that my philosophical commitment is the exact opposite of that which I explicitly defend at very great length in fact support his interpretation of RSS II as a normative moral theory. At best they show that metaphysical consistency is compatible with physical embodiment. But on my view, that is not in dispute. About the subsequent discussion of Myron’s gluttony, Guyer comments that he finds it difficult to read that passage without “taking it to imply that Myron has a genuine choice whether or not to stick to his diet at dinner-time, thus that there is no metaphysical necessity that he maintain his resolve etc.”. My statement that “Myron chooses to avoid this condition of disconnected bewilderment etc.” certainly does imply that Myron has a choice etc. But Guyer conflates Myron’s choice to avoid a state of disconnected bewilderment with the highest-order disposition to metaphysical consistency it presupposes, and that transforms that choice option into a motivationally effective preference. And his observation that no metaphysical necessity is involved, with which I of course also agree, conflates this cryptic Deductivist notion of metaphysical necessity which we both reject with the more robust concept of the metaphysical consistency which I claim any such choice presupposes. (2) Similarly, Guyer takes my carrot-stick metaphor for the disposition to metaphysical consistency to show that I am really talking about a “psychological characteristic of a flesh-and-blood agent etc.”—as though metaphysical consistency could only be a transcendent characteristic of nonmaterial noumenal agents. Just as flesh-and-blood agents have a hard-wired predisposition to physical entropy, they can also have a hard-wired predisposition to metaphysical consistency. My thesis is that they must, to the extent that they are able to form coherent intentional states at all. (3) Furthermore, he rightly finds in my sentinel metaphor for the highest-order disposition to literal self-preservation a “causally efficacious psychological disposition”, but then wrongly infers from this that this disposition therefore must be a psychologically transient inclination rather than an enduring metaphysical precondition for forming inclinations of any kind. However, we have just seen that flesh-and-blood agents can have causally efficacious psychological dispositions that are enduring and hard-wired rather than transient. Other examples would include the psychological dispositions to react to stimuli, to explore the environment, or to ignore anomaly. All can and do serve as metaphysical preconditions for more specific states or behaviours—such as, respectively, to answer the telephone, to open a closed door, or to overlook E.T. crouching in the corner. Piper also observes that once the psychological disposition toward unified rather than psychotic selfhood “does take hold, it will bear a relation to individual act-tokens most of the time, even if the requirements of duty are violated occasionally, and even if one then need not be preoccupied with these requirements most of the time” (II, p. 209); this is an eminently reasonable thing to say, but it could not be said if unified selfhood were a metaphysically necessary condition of genuine action. However, I say this reasonable thing about Baron’s view, not my own. Guyer’s assemblage of unrelated passages critiquing other people’s views would not be relevant to a defence of his claim that mine is normative. Actually he offers no such defence. I infer from exegeses (1)–(4) that Guyer is using the term ‘metaphysical’ to refer to states of affairs that are necessarily nonphysical and nonmaterial—i.e. beyond the scope of the empirical world as Kant defined it in the Critique of Pure Reason. This use of the term conforms well to Kant’s in his critique of speculative metaphysics in the Antinomies. But it does not conform to mine. It is a straw man, cobbled together out of disparate and irrelevant passages, that Guyer and I both agree is implausible. The ideal agent I describe in the first half of RSS II does not set a standard we are exhorted to emulate, because it is not the kind of ideal an agent can aspire to emulate. So getting bogged down in searching for someone to normatively exhort would have delivered even less bang for the buck than getting bogged down in the flatulent cloud of metaphysical necessity. A careful reading of RSS II will confirm that it makes neither of these mistakes. Richard Bradley’s comments are focused on RSS II, Chapter III, ‘The Concept of a Genuine Preference’, in which I defend the thesis that, like all other conscious intentional states of a rationally unified self, preferences—understood in the broad, decision-theoretic sense as encompassing intentions and resolves in addition to desires—are similarly structured by and subject to the requirements of classical predicate logic; and therefore that rational preferences must meet exactly the same constraints of logical consistency. I am relieved and grateful to have his endorsement of my claim that preferences express categorical judgements. I now explore some of the implications of that claim. I argue here that Bradley cannot consistently accept that claim yet deny that intransitive preferences violate the requirement of logical consistency even when the agent’s preferences are incomplete. (1) Agent S prefers option x to option y. (3) x is y’s sister. The traditional semantics of classical predicate logic permits (1) and (3) as two conflicting interpretations of (2), but its syntactical cache is not rich enough to represent the structural difference between them. I defend this claim at length in RSS II, Chapter III, Section 1, “A Problem about Cyclical Inconsistency”. (5) x is greater than y. (6) x is preferred to y.
on the basis of which mathematical calculations of subjective utility are then to be performed. using the Boolean connective ‘and’ because nesting x and y in their respective intentional attitudes extends to them the propositional status of the intentional attitude in which they are nested. Eliminate those nesting intensional contexts and there is nothing for an extensional connective to connect. Isolated intentional objects are not the kind of entity that can have extensional propositional status. Similarly, you cannot connect a hope to a dream using telephone cables. You cannot line up a memory of summer camp with a memory of college with a memory of internship along an interstate highway. You cannot link up an imagined garden with an imagined lawn sprinkler using pliers and copper wire. A fortiori, you cannot connect isolated intensional objects of any kind, including preference alternatives, using extensional connectives of any kind, including mathematical ones. That the traditional notation of Ramsey-Savage decision theory renders the intensionality of such objects invisible does not render it nonexistent or unimportant. Rather, such a notation reveals its inadequacy to the requirement of veridical representation. It needs to be revised. I defend this claim at length in RSS I, Chapter IV, Section 2, “The Ramsey-Savage Concept of a Simple Ordering”; and RSS II, Chapter III, Section 2, “Savage’s Concept of a Simple Ordering Reconsidered”. 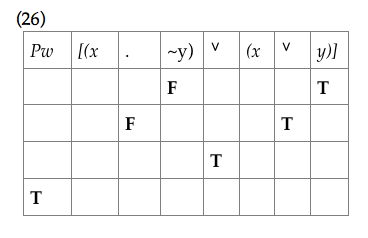 (11) Y is at least as preferable as X. As with (6), ‘at least as preferable as’ is an intensional phrase that ranges over two intentional objects. But (11) obscures its intensionality even more than (6). In addition to its passive grammatical construction, (11) substitutes the modal locution ‘as preferable as’ for the indicative locution ‘is preferred to’. But preferable to whom? The modal locution approaches extensional status only to the extent that something can be preferable independently of the existence of any possible subject to whom it is in fact preferred. As the concept of being preferable without being preferred to some possible subject is incoherent, the implicit intentional attitude cannot be eliminated. Hence there are no grounds for ascribing extensional status to Bradley’s modal locution. (10) remains an intensional statement consisting in an intentional operator ‘≾’ that governs a pair of intentional objects whose intensional status is obscured by the notation. This means that whereas (4) purported to connect two intensional objects using an extensional operator, (10) in fact does not aspire to connect two objects at all, because ‘≾’ is not a connective but rather an intentional operator that expresses a subject’s intentional attitude. It does not contain the syntactical resources for rank-ordering its subsentential constituents. (10) denotes a relation between X and Y only in the semantic sense of (2). By itself, and like (2), (10) does not expose any syntactical substructure at all. How the two objects X and Y are related in (10) depends on the semantic interpretation of the expression, rather than—as in (4) and (7)—the syntactic ordinal substructure that the symbolisation itself identifies. Then this interpretation provides no warrant for ascribing the ordinal ranking required for calculations of subjective utility to a series of such statements expressing this intentional attitude toward pairs of intentional objects. And we have just seen that the isolated intentional objects themselves also fail on this count. (15) Y is at least as preferable as X and X is not at least as preferable as Y.
without loss of meaning. Categorical judgements of this description are internally intransparent. (14) does not contain the syntactical resources necessary for illuminating an ordinal relationship among those constituents because it is internally intransparent. The only structure Bradley’s notation can expose is that supplied by the Boolean connectives that relate these internally intransparent judgements. So (14) works neither as an intensional definition of (12), nor as a symbolic representation of (15). However, (15) presents further intransparencies. Something cannot be at least as preferable as something else without there being some implied third thing to which the first two are at least as preferable. An apple can only be at least as preferable as an orange if there is also, for example, a prune, to which they are at least as preferable. Thus (15) is grammatically incomplete without mention of the third term of comparison that reveals it to be a triadic rather than a pairwise comparison—and therefore unsuitable for purposes of this discussion. However, (18) is a premise of classical first-order predicate logic; and that premise is not among the axioms of Ramsey-Savage decision theory. In fact, (18) cannot be stated within the notational constraints of traditional Ramsey-Savage decision theory at all, and we have just seen that Bradley’s replacement of ‘<’ with ‘≾’ does not address this problem. Without piecemeal importations of syntax from natural language, mathematics, and predicate logic, Bradley would be unable even to formulate (17). without loss of meaning. As it stands, (19) does not expose enough sentential substructure to ascertain whether it conceals a contradiction or not. There is no way solely within the syntactical constraints of traditional Ramsey-Savage decision theory of ascertaining whether (X ≾ Y) and ~(X ≾ Y) are contradictory or not; nor, therefore, whether someone who judges that X ≾ Y and that Y ≾ Z but not that X ≾ Z makes any strictly contradictory judgements or not. On this count, (17) and (19) must stand or fall together. Like Davidson, McKinsey & Suppes (1955) and the many others who have subsequently addressed this problem, Bradley must resort to the extrinsic resources of natural language even in order to state it. His notation, too, is not fine-grained enough to detect the differences, and the extensional mathematical conventions on which it relies obscure what the differences might be. For the reasons just described, neither classical predicate logic in its traditional form, nor traditional Ramsey-Savage decision theory, nor Bradley’s proposed reform of it, suffice to expose the intensional and subsentential structure of binary categorical judgements expressing pairwise comparisons between preference alternatives. Without making this substructure visible, I would agree with Bradley that it is difficult to see in what sense preferences are subject to the same logical consistency constraints as other intentional attitudes; and therefore in what sense (19) might violate the law of non-contradiction. As it stands, (19) does not comprise the kind of judgements that can be contradictory. The concept of a genuine preference that I defend at much greater length in RSS II, Chapter III is designed to redress this problem. Rather than rehearse the details of that proposal here, I offer merely a brief summary and refer the reader to that and the preceding chapter for a fuller exposition. In RSS II, Chapter II, I argue that all cognitively operative intentional states of a unified self must satisfy two rationality criteria, of horizontal and vertical consistency. Horizontal consistency applies the quantified law of non-contradiction to the subsentential constituents of categorical judgements. These subsentential constituents consist in the variable terms and n-adic predicates ascribed to them of sentences in predicate logic. Vertical consistency applies the quantified law of modus ponens to the inferential relationships among such constituents, such that the lower- and higher-order concepts that figure in such judgements are logically consistent with one another. The variable term calculus introduced in RSS II, Chapter III offers a syntax for structuring subsentential constituents as they appear in categorical judgements expressing intentional attitudes. I focus on preference in the broad decision-theoretic sense, and in particular on preference over multiple alternatives, because that is the most troublesome intentional attitude for a Kantian theory of action capable of anchoring a plausible and robust metaethical analysis. The basic idea is to extend the Boolean connectives and quantificational conventions of classical predicate logic to these constituents. I impose on such sentences the same familiar opacity constraints as in any intentional logic. The resulting apparatus preserves the traditional conventions of classical predicate logic, but also extends them to the subsentential structure of sentences expressing intentional attitudes in that logic. My proposal differs from other intentional logics in that it treats the symbol for preference, P, as a first-order predicate rather than an intentional operator. This enables me to more closely conform the variable term calculus to those well-established conventions, and to then express the consistency constraints on n-adic judgements of preference in terms of them. RSS II, Chapter III, Section 5, walks the reader through the basics of this apparatus; and demonstrates how to navigate with it. Section 6 contrasts my approach with those developed by Mark Kaplan, on the one hand, and Richard Jeffrey and Ethan Bolker, on the other; and argues for the superiority of mine over both. Preference is inherently bound up with action, and therefore must be represented dynamically. Hence Sections 7 and 8 formulate five further familiar criteria that such a genuine n-adic judgement of preference must meet: Asymmetry, Connectivity (basically equivalent to Bradley’s Completeness), Irreflexivity, Transitivity, and Ordinality. I argue that these seven criteria constitute a conceptual truth about in what a genuine preference consists. The conjunction of (27), (28) and (29) constitutes a contradiction. So Bradley’s claim that “someone who judges [in the manner of (25)] does not make any strictly contradictory judgements” is false. If transitivity is, as I have argued in RSS II, Chapter III, a requirement of logically consistent preferences, then (25) violates that requirement. Both of these conclusions hold whether w’s preferences are complete or not. Nevertheless, I think there is truth to be gleaned from Bradley’s claim. For the fact that (25) is intransitive does not imply that it is cyclical. Unlike a cyclical ordering of strict preferences, (31)—the third conjunct of (25)—in fact does not express a determinate ranking of x and z at all. Rather, it is ambiguous between the cases in which agent w does not weakly prefer x to z because (a) she is strictly indifferent between them; (b) she weakly prefers z to x; (c) she strictly prefers x to z; (d) she is not offered a comparison between x and z in the first place. 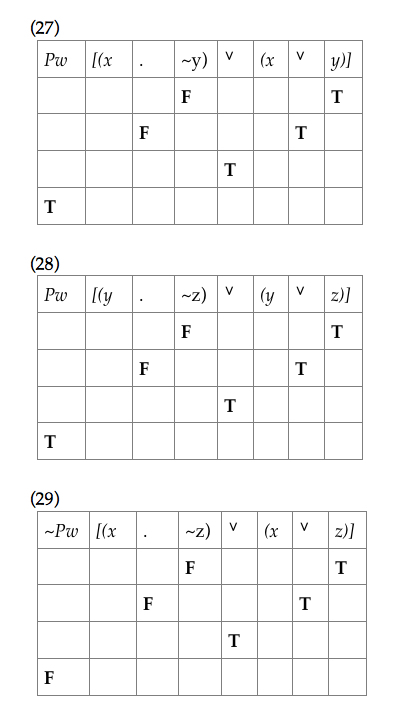 That intransitivity is not logically equivalent to cyclicity can be shown using the truth table method above. But I leave that as an exercise for the reader. Davidson, D., J. McKinsey & P. Suppes (1955), ‘Outlines of a Formal Theory of Value, I’, Philosophy of Science 22(2): 140–60. Hintikka, J. (2002), Logic, Language-Games and Information: Kantian Themes in the Philosophy of Logic (New York: Oxford University Press). Korsgaard, C. (2009), Self-Constitution: Agency, Identity, and Integrity (Oxford: Oxford University Press). Piper, A. (2012), ‘Kant’s Self-Legislation Procedure Reconsidered,’ Kant Studies Online 2 (October): 203–77. ——— (2014), ‘The Money Pump is Necessarily Diachronic’. Rawls, J. (1951), ‘Outline of a Decision Procedure for Ethics,’ the Philosophical Review LX(2): 177–97. ——— (1971), A Theory of Justice, 1st edition (Cambridge, MA: Harvard University, 1971). ——— (1980), ‘Kantian Constructivism in Moral Theory’ [The Dewey Lectures 1980], Journal of Philosophy LXXVII(9): 515–72. ——— (1985), ‘Justice as Fairness: Political not Metaphysical,’ Philosophy and Public Affairs 14(3): 223–51. Sen, A. (1970), Collective Choice and Social Welfare (San Francisco: Holden-Day). © Adrian Piper Research Archive Foundation Berlin, 2018. Adrian Piper did her dissertation on rationality with John Rawls at Harvard University in 1981. She taught at Harvard, the University of Michigan, Stanford, Georgetown, UCSD, and Wellesley. Her primary philosophical publications are in Kant, metaethics, and the history of ethics. Recently, she published her ESCAPE TO BERLIN: A TRAVEL MEMOIR (APRA Foundation Berlin, 2018). Piper is also an artist.